Assimilating and accommodating new ideas and ways to do things is not always an easy task. Sometimes we find ourselves too close to old and comfortable ideas, unable to find a perspective from which to evaluate the potential for the new. For learners of all ages, it is a challenge to help them shift their perspective to see how the new can fit with their existing worldview. The problem is not so much what is presented, as with how. 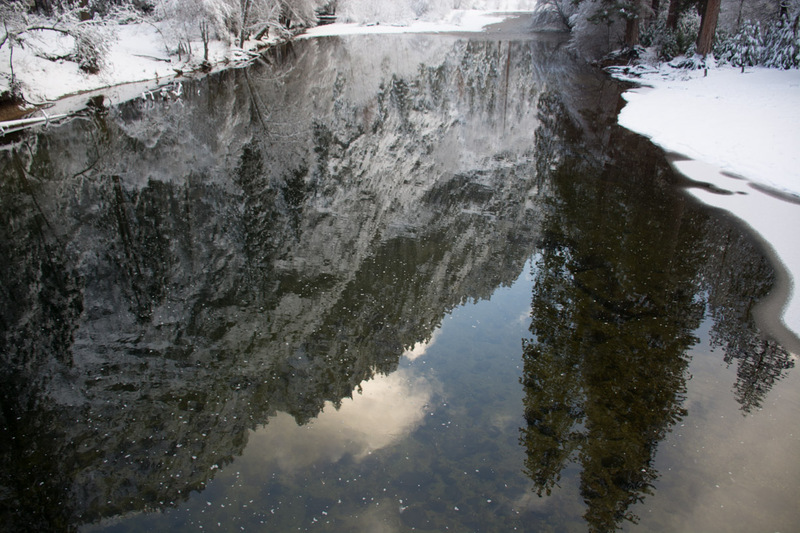 Sometimes finding the new perspective requires a trip beyond the confines of the planet we think we know so well. Two areas of science in particular are not well understood for the general public at large, as well as many teachers and their students: evolution and climate change. All too often, both topics are presented pedantically through a series of lectures, exercises depending on rote memorization, and perhaps a few activities with pre-determined outcomes, which do little to help students build a conceptual framework for either to fit into their basic understanding of how nature operates. This can only add to the difficulties many have accepting either or both evolution and climate science. Other areas of science do not seem to share the same disdain many people have for these particular ideas. Part of the problem has to do with time. Time in that an understanding of both evolution and climate change require an acceptance, and ability to think about change over a time scale far greater than what people experience in their daily lives, let alone over the span of a lifetime. For the most part, we lead existential lives, moment to moment, with little thought beyond our current experience. The idea of deep time so prevalent in much of astronomy, and certainly in geology and evolutionary science, does not resonate with the average person. In general, people are fascinated with the idea of aliens, the discovery of planets orbiting distant stars, and the exploration of planets within our own solar system. The idea life might exist on those planets piques the intrigue people feel when hearing about them. Particularly the kind of life that could look back at our system of planets and wonder the same thing. In thinking about the potential for life on these other worlds, again, people seem to have a tendency to think of that life existing in the here and now. It is equally possible these planets once had life, which went extinct, or it may more closely resemble stromatolites from early in Earth’s history with intelligence perhaps in the planet’s future. Within our own solar system Mars, while in the habitable zone, does not have life though it may have in the distant past. Venus is on the edge of the habitable zone, though a runaway greenhouse effect made for an inhospitably hot atmosphere. Neither planet currently possesses an atmosphere capable of supporting life as we know it. There is a cognitive dissonance in not accepting evolution and climate science while at the same time getting excited about the potential for life on distant worlds. Both evolution and climate science are key areas of research for an astrobiologist in the quest to understand the dynamic nature of planets and their ability to support life. People find it easy to think about these phenomena when they take place elsewhere in the universe, but when we turn around and look at our own planet, we can’t apply the science to our own situation. There is an opportunity for educators to take advantage of this relationship, engaging the imagination of students while they learn about the factors that make life possible on other worlds. It may prove easier to think about the history of these distant objects than it is about our home planet. Can we apply the lessons learned on distant worlds to foster a better understanding of our own situation? For a learner asked to learn and apply new skills and ideas, it frequently comes down to going beyond what they are familiar with, looking at a completely different situation, examining it in fine detail, then building a generalizable model to their own situation. Sometimes one is just too close to the object under scrutiny to look at it with the objectivity needed for understanding and acceptance. This post originally appeared as the Education Matters column in the spring 2017 issue of Mercury Magazine, a publication of the Astronomical Society of the Pacific. Going to the mountains is a pilgrimage. For as long as I can remember, the mountains have provided a haven, a place for contemplation, a respite from the the ordinary. In younger days it was the Cascade Range, with its volcanic edifices atop a basement of older plutons and metamorphic rocks. Then later the volcanic landscapes of the Oregon Cascades, the stacked metasedimentary rocks of the Canadian Rockies, the Overthrust Belt of western Wyoming. and the remote reaches of Alaska’s Brooks Range. It is relatively recently I discovered the varied mountains of California, including the starkly beautiful ridges and valleys in the Transverse Range and Santa Monica Mountains. 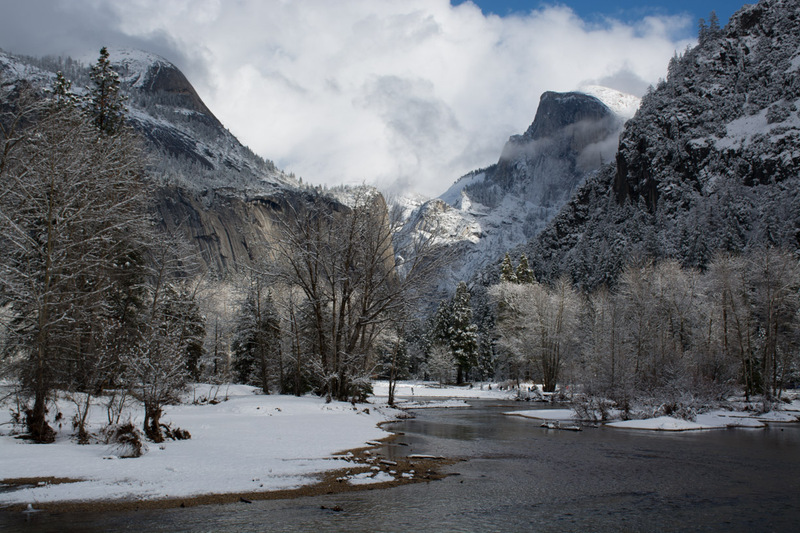 Yosemite always beckons. For the first time in over a year, I heeded the call. Even in fall the Cathedral Lakes trail has upwards of a hundred people following Muir’s admonishment. 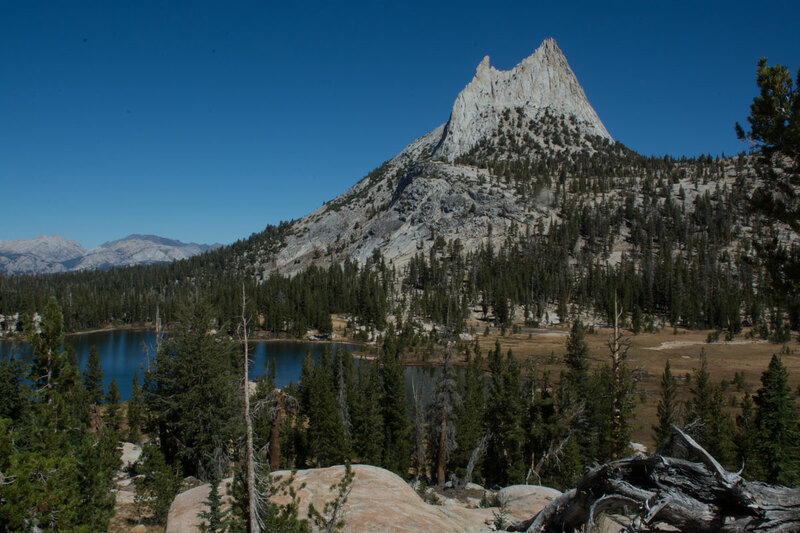 The trail to the lakes, and above to Cathedral Pass cross the Cathedral Peak Granite, a marvelous rock with very large megacrysts of the mineral orthoclase, a potassium-rich feldspar. These crystals are pervasive in the rock, with many areas where you find large masses of these 2- to 4-inch crystals. The orthoclase is more resistant to weathering than the surrounding smaller crystals, forming knobby surfaces. Glacially polished surfaces show no preference for orthoclase or groundmass, they both polish up equally well. 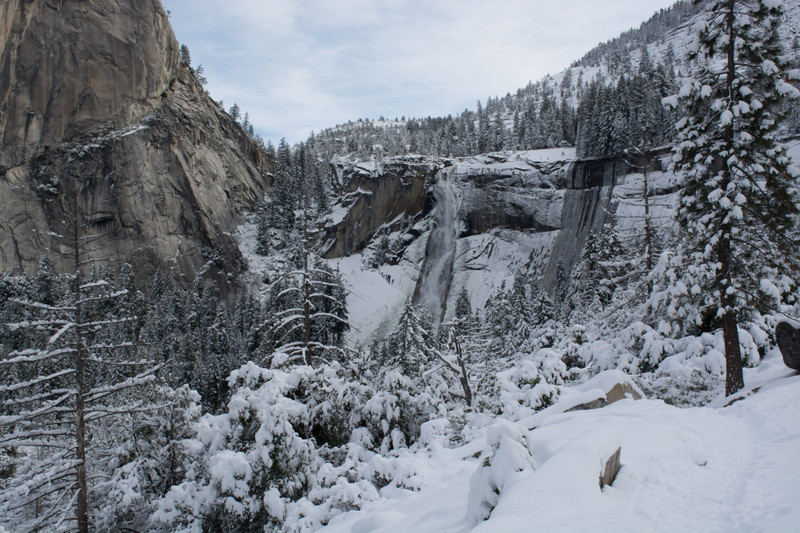 When hiking the trails of Yosemite, one is never alone. Which made a hike to Mono Pass, then onward to Parker Pass all the more notable. 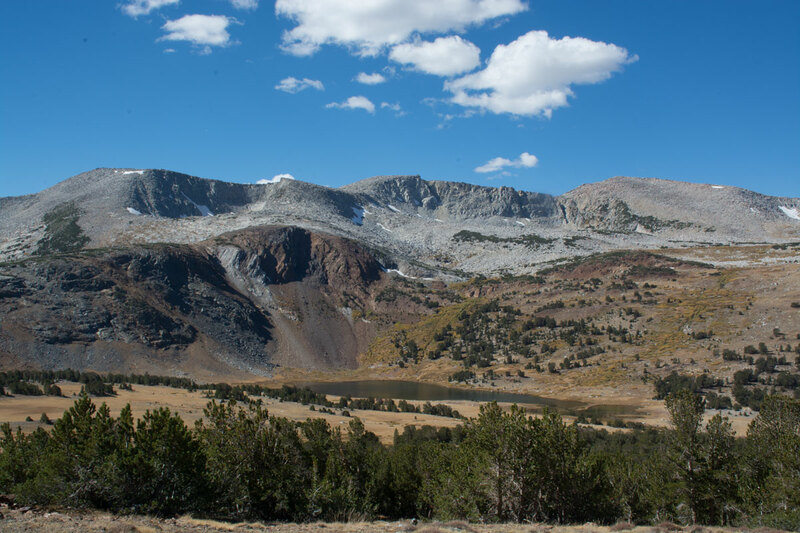 It was a solitary hike, with only the rocks, stunted trees in the high country, raucous Clark’s Nutcrackers, and the wind for company. 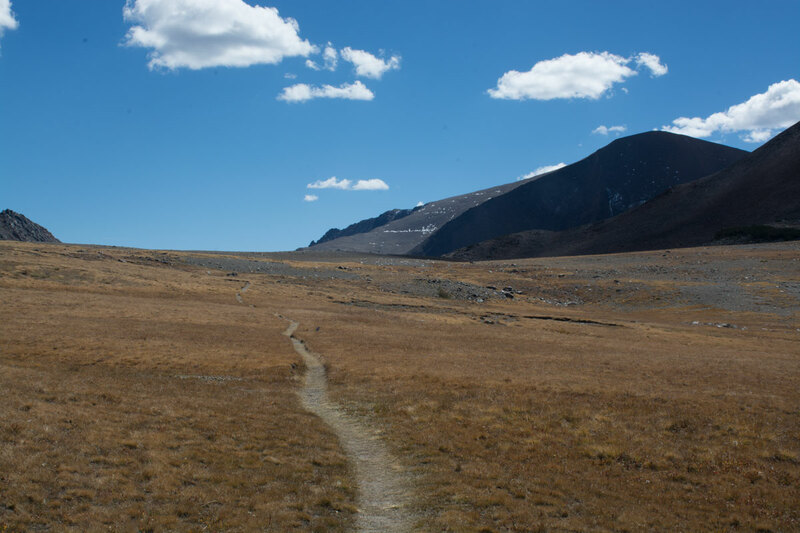 It was not until the last hour of the hike, on the way back to the trailhead, when I encountered another hiker, then saw five other people within the space of a half mile. 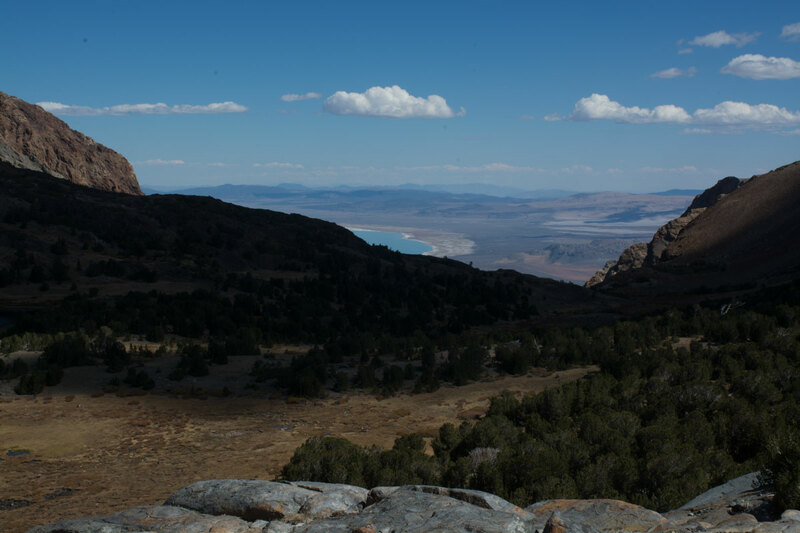 The hike to Mono and Parker Passes takes one into the country rock which surrounded the granite masses when they were intruded. 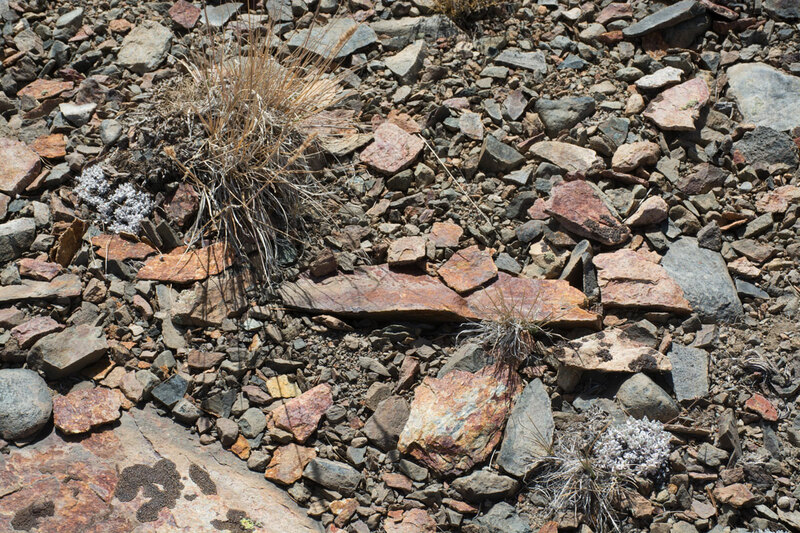 Dark, gray and red, these rocks are metamorphosed sedimentary and volcanic rocks far older than the granites. 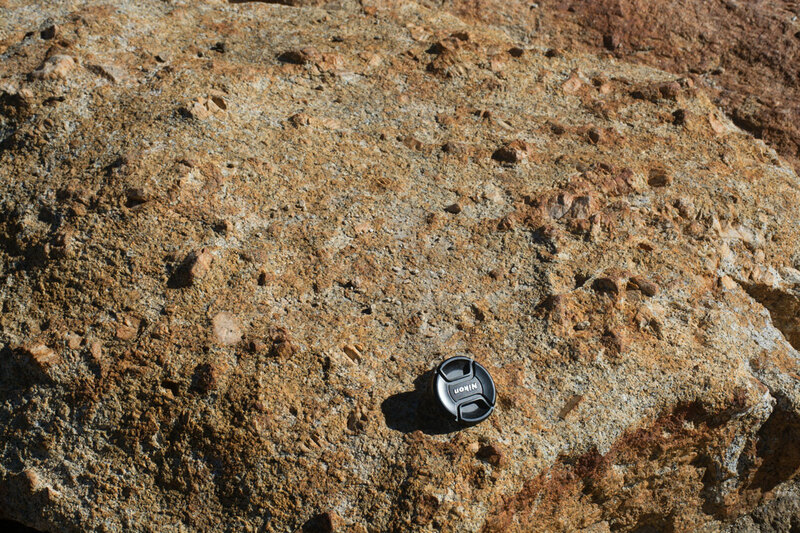 At times it was easy to see the contact zone between the two types of rocks, which provides a sense of some of the dynamics that took place when the granites were intruded. 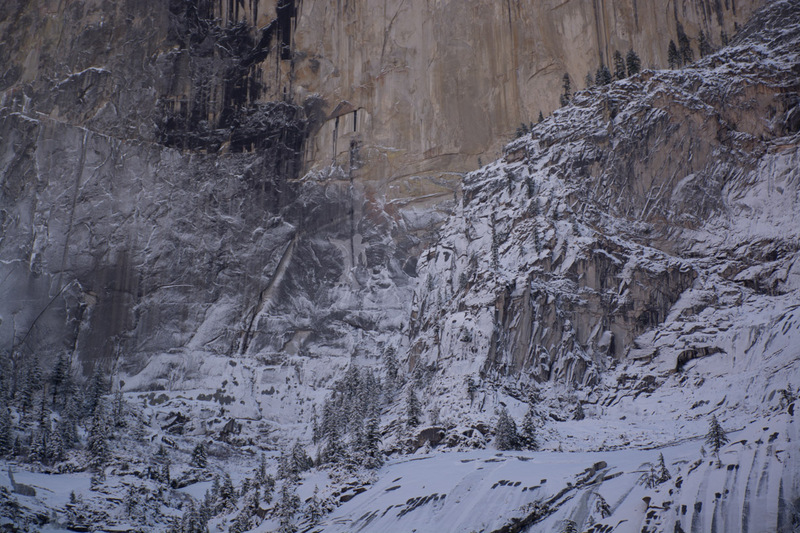 The metamorphic rocks are more easily weathered, and tend to break down into smaller fragments, which results in less craggy peaks compared to those of granite. These excursions into the back country reveal the depths of time. The story of mountain building in this part of the world starts with ancient rocks which had their origins undersea and were subsequently altered through the action of heat and pressure, the emplacement of granite at a time when dinosaurs roamed a good part of the Earth, and culminates with the recent uplift associated with the formation of the basin and range province covering much of Nevada. 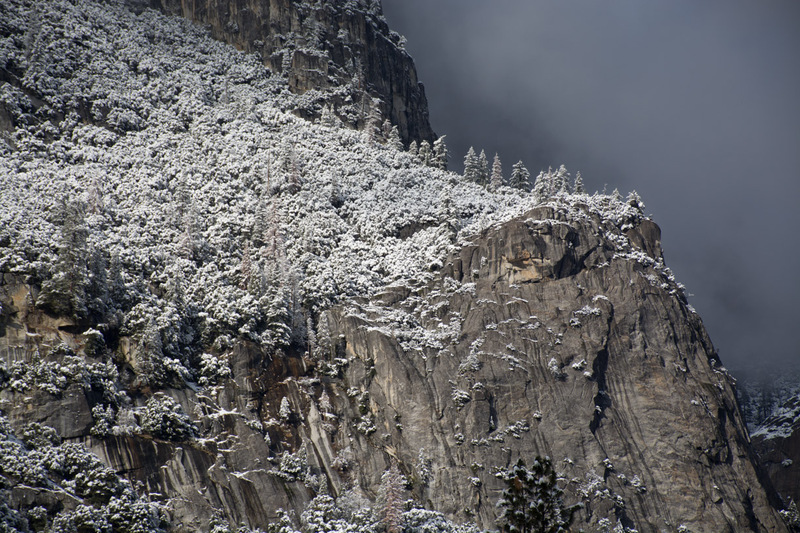 It is the much more recent tearing away at these mountains that created the allure drawing millions to Yosemite each year. 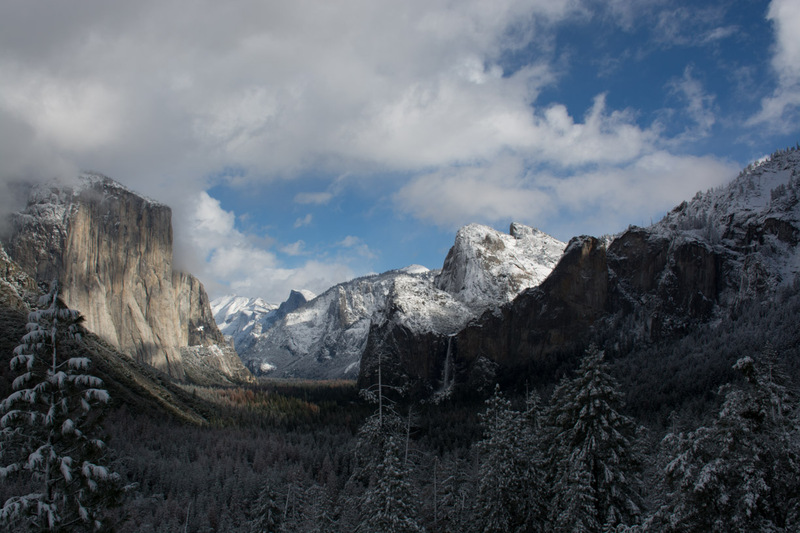 The evidence is everywhere: from the can’t miss vertical cliffs and bare granite domes, the hanging valleys with cascading waters, to the subtle ridges of moraines left behind when glaciers retreated, and the polished rock surfaces. 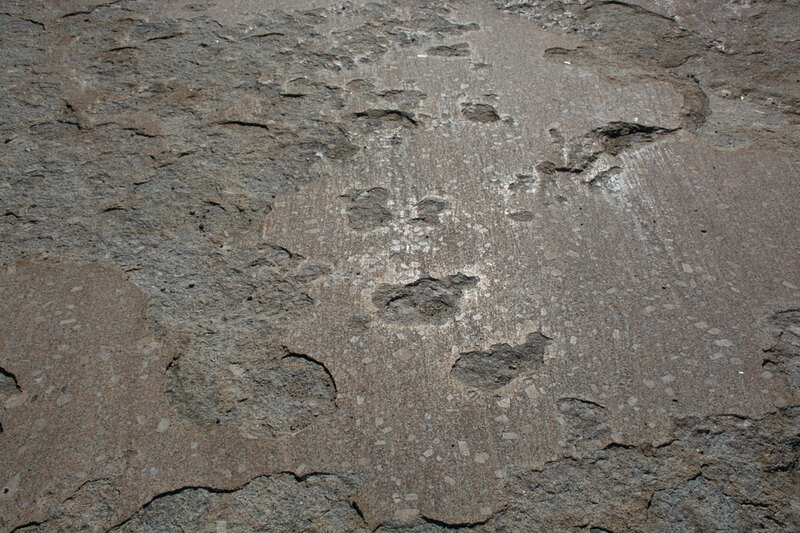 Weathering and erosion have left their mark on the land. 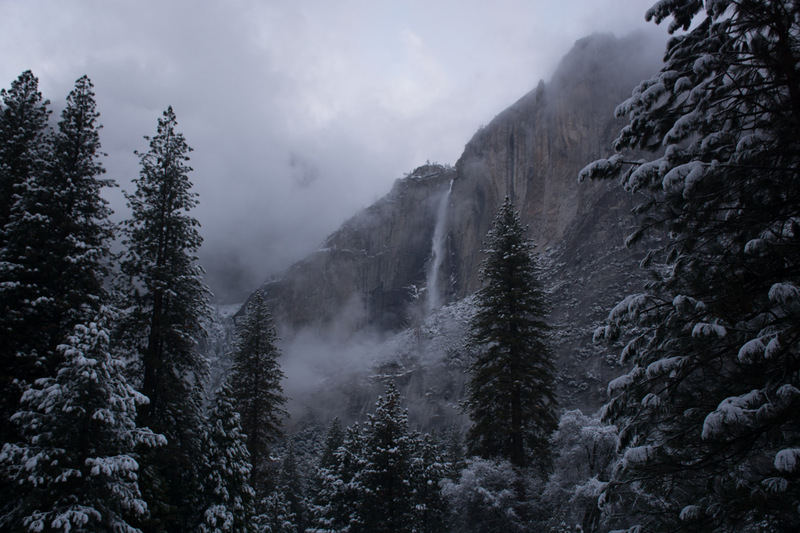 The tidings of the mountains are the very story of the Earth itself, nature’s source for the tale of deep time. It is there for all to read and hear, one just has to slow down to look and listen. This past August, I had eye surgery, an event giving me a renewed appreciation for what our brains are capable of, and their elasticity in accommodating and assimilating sensory input as well as ideas. My recovery reminded me of the film shown in many classes in the 1960s, where a researcher wore a set of glasses that caused the world to appear upside down. Within a few days, the researcher’s brain inverted the image and the world once again appeared right side up. A couple of days later the glasses came off, and everything again was upside down, and eventually the researcher again perceived the world as before the experiment. It takes babies several weeks for their brains to learn how to fuse the inputs from each eye into a single image. In my case, a defect in my eye muscles caused them to not work properly, creating a misalignment of my eyes. The misalignment was great enough that my brain couldn’t compensate for the difference, resulting in some double vision. Minor surgery was successful at correcting my muscular imbalance, aligning my eyes so my brain is able to fuse the input from both eyes into a single image. 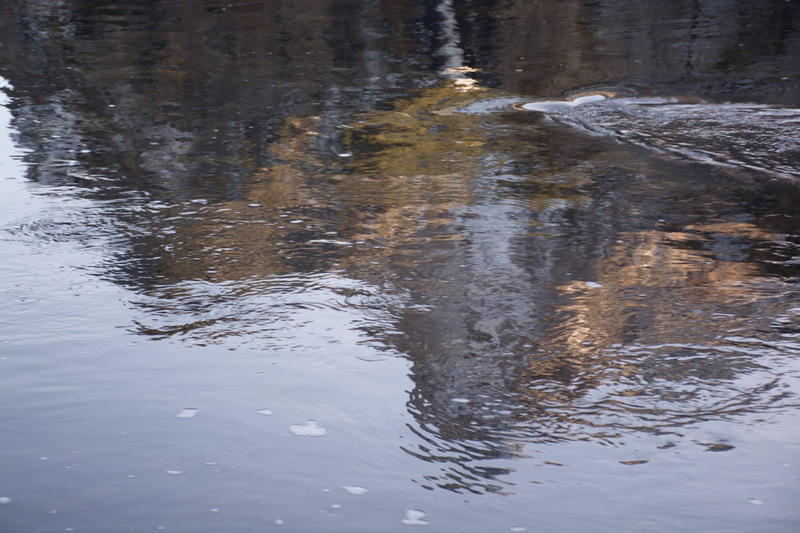 But the fusing of these images following surgery was not instantaneous, and took several weeks for my brain to relearn how to see and completely restore my singular perception of the world. As with babies, the ability to track moving objects took longer to redevelop. The restoration of my sight is somewhat analogous to what educators do when confronted with a learner’s lack of understanding, and perhaps misconception of scientific principles and/or natural phenomena. An in depth understanding, and ability to thoroughly explain phenomena requires time and multiple opportunities to practice, with sustained contact with the concept over many days if not weeks. As with any learner, effective teacher professional development related to natural phenomena should include reinforcement over time. In the case of solar and lunar eclipses, one could show someone a diagram and explain the phenomena in words, which a learner could, in all likelihood recite verbatim back to the explainer. However, really owning the concept through cognitive accommodation and assimilation takes time and an awareness of a suite of background concepts and phenomena including: Earth’s (and the Moon’s) rotation and revolution, and their relationship to how time is measured; shadows and light, particularly the kind of shadow cast by a spherical object illuminated by a single, point source; the measurement of angular size; size and distance scale of the Earth and Moon; the frequency and pattern of lunar phases; and the frequency and pattern of lunar and solar eclipses, and their relationship to lunar phases. The learning of any one aspect of eclipse phenomena is akin to keeping one eye closed when looking at a distant object. The depth of understanding is lost, much as binocular vision is necessary for visual depth perception. A misconception, such as lunar phases are the Moon passing into Earth’s shadow, or the Moon really is larger when it rises is similar to having both eyes open but with each eye gazing in a slightly different direction. The brain may pay greater attention to one image while relegating the other as an annoyance safely ignored. Unfortunately, many misconceptions offer a stronger, and perhaps more intuitive appeal, until the learner is confronted with evidence with which to dispel the misconception. It is in the fusing of all the experiences where in-depth learning and integration of a concept takes place. 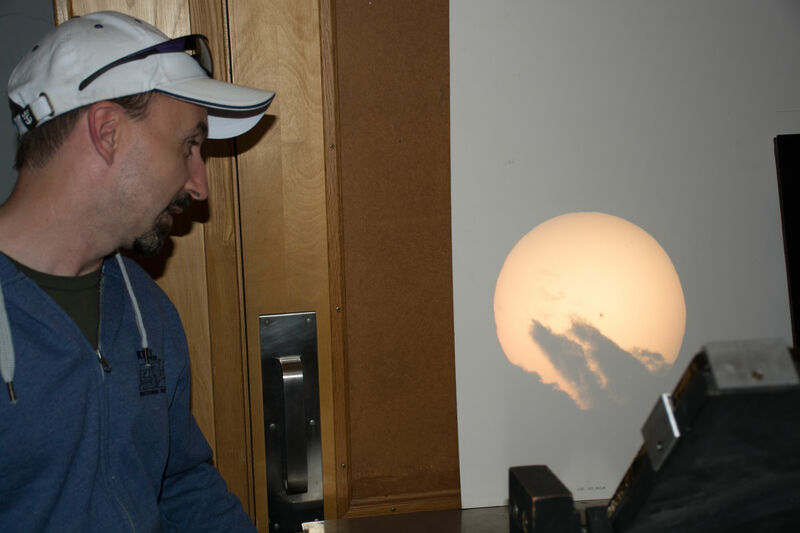 As mentioned in previous Education Matters columns, the Next Generation Science Standards have provided a marvelous framework for engaging learners in the sorts of in-depth investigations necessary for fully understanding eclipses. Through the use of a storyline approach, educators can actively engage learners in each of the essential background concepts mentioned above. Using resources developed for ASP programs the Night Sky Network, Project ASTRO, and Astronomy from the Ground Up, ASP staff have created such a storyline and are using it in workshops to help educators prepare for next year. The total solar eclipse on August 21, 2017 is a teachable moment without compare. Taking place mid-day, on a day when many schools throughout the country are in session, it is an opportunity for educators, in and out of the classroom, to engage learners of all ages in experiences with both eyes open, both literally and metaphorically, promoting a full understanding of a phenomena that has caused wonder and bafflement for millennia. This post originally appeared as the Education Matters column in the fall 2016 issue of the ASP’s Mercury magazine. Recently, The National Academies Press published Science Teachers’ Learning (NAP, 2015), a report on the current state of science teacher preparation, along with recommendations for approaching how and when teachers engage in professional development, and the necessary changes to education policy influencing those opportunities. I became aware of this new resource at the 2016 NSTA National Conference on Science Education in Nashville, Tennessee, when Dr. Julie Luft, a member of the committee that worked on the report, gave a presentation to a joint meeting of the National Science Education Leadership Association (NSELA) and the Association for Science Teacher Education (ASTE). In her talk, Dr. Luft presented some sobering, but not surprising, statistics from the report: during a three year period, 41% of elementary teachers participated in no science related professional development (PD). And only 12% participated in the equivalent of one day of science related PD during the same three-year period. This is in stark contrast to the 18% of middle school, and 15% of high school teachers who did not engage in science related PD. 47% of middle school science teachers, and 57% of those in high school participated in at least one day of science PD per year during the same time. Elementary teachers are particularly challenged compared to their secondary colleagues due in large part to their teaching multiple subjects, particularly math and language arts, which are emphasized due to their prominence in the high-stakes testing that has influenced education policies since the implementation of No Child Left Behind. As a result of these policies, studies cited in the NAP report indicate only 19% of K-2 classrooms, and 30% of those in grades 3-5 receive science instruction on a daily basis. When science is offered, it only accounts for an average of 19 minutes per day in grades K-3, compared to 54 minutes for math, and 89 minutes per day in language arts. Grade 4-6 classes show a slight increase to 24 minutes per day for science instruction. These short time spans for science results in learners making few connections between the instruction and developing a rudimentary understanding of basic scientific concepts. Even in classrooms where science takes a greater role, elementary teachers are generally unprepared to develop learning opportunities for their students, let alone implement them. While teaching basic scientific concepts requires a different skill set and knowledge base than that required for engaging in scientific research, few teacher preparation programs provide adequate opportunities for acquiring the relevant pedagogical content knowledge. Only 5% of elementary teachers majored in a science-related field, about the same as the 6% who took no college science courses. As noted in previous Education Matters columns, from time to time I visit science methods classes in teacher preparation programs at local universities. I also have interacted with inservice elementary teachers during teacher resource fairs, and professional development workshops delivered at the Astronomical Society of the Pacific. While many of the elementary teachers I come in contact with have a relatively sophisticated understanding of science, a large number of the early elementary teachers I have spoken with demonstrate the opposite. One first grade teacher in particular described how he incorporated the scientific method in activities, with students conducting controlled experiments. During our conversation, we discussed how the scientific method is a myth, and how there are a great many ways of doing science. Much of biology, as well as earth and space science do not conduct controlled experiments, and rely on observation, prediction, and modeling to arrive at conclusions. A more developmentally appropriate approach for engaging a first grader involves emphasizing questioning, and making observations to recognize and describe patterns. The ability to control variables is cognitively available for somewhat older learners. A Framework for K-12 Science Education (NAP, 2011), and the subsequent Next Generation Science Standards (NAP, 2013), set the stage for significant changes in how teachers, including those at the elementary level, will approach their curricular and instructional decisions. Teacher preparation programs, as well as professional development providers (including the Astroteacher and the Astronomical Society of the Pacific) are in the process of redeveloping their offerings to reflect these changes. The emphasis on student engagement in the practices of science, and reasoning from evidence requires a better understanding on the part of implementing teachers of both the core ideas and concepts of science, and their application during active investigations through the use of the practices. The implication of the report, and efforts to fully implement the philosophy laid out in the Framework, is the dearth of science instruction in elementary grades must, and will increase. To accomplish this, the frequency and quality of teacher learning must also change. Note: This post originally appeared as the Summer 2016 Education Matters column in the ASP published Mercury magazine. The author serves as the Region F Director for the National Science Education Leadership Association (NSELA). In their quest to understand and explain the natural phenomena they experienced on a daily basis, our ancestors told stories, many of which became the myths and legends with their pantheon of gods. Objects such as the Sun and Moon, as well as more earthly places such as the seas and volcanoes, were the manifestations of the unseen beings behind the phenomena. Monuments and cathedrals were built to honor these deities, while providing a place in which to worship. In our modern age, scientists have explained the vast majority of the phenomena formerly attributed to magical or supernatural beings. In one way the practice of science has led to the creation of new edifices, the instruments with which scientists undertake their investigations. 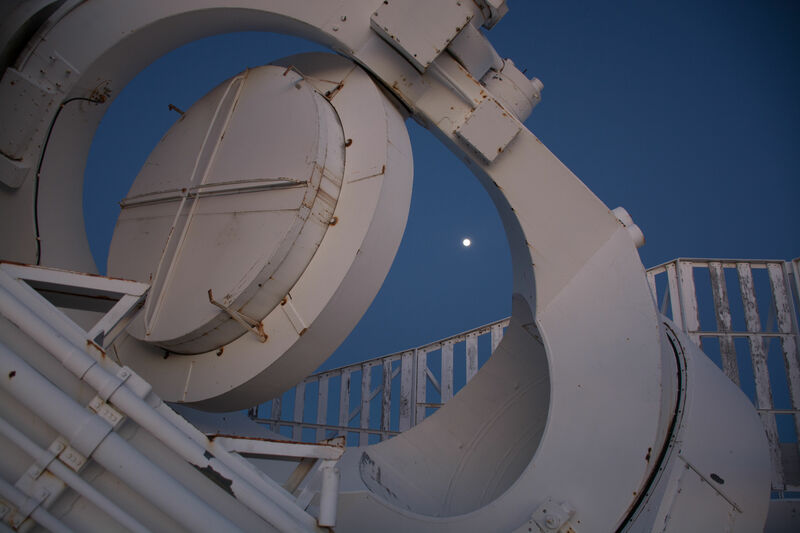 Astronomers have a particularly visible set of instruments, the observatories whose domes grace mountaintops in many places around the world, as well as in orbit above the obscuring effects of Earth’s atmosphere. 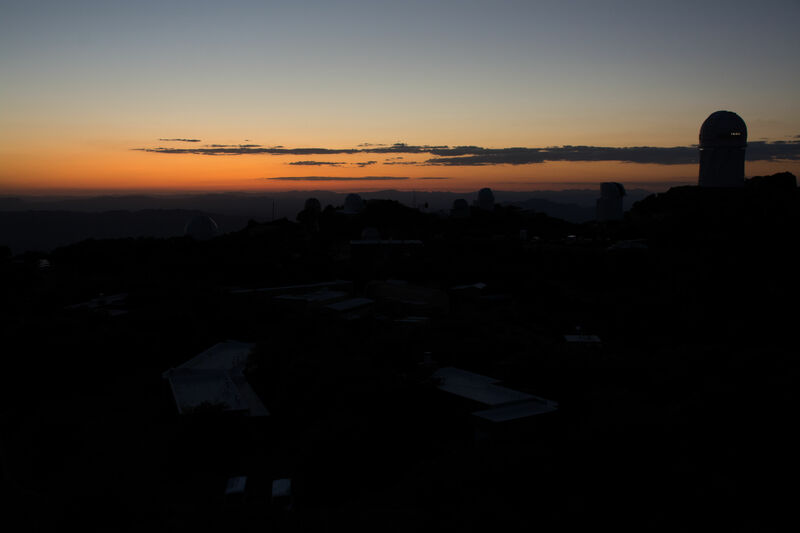 Kitt Peak is one such place. 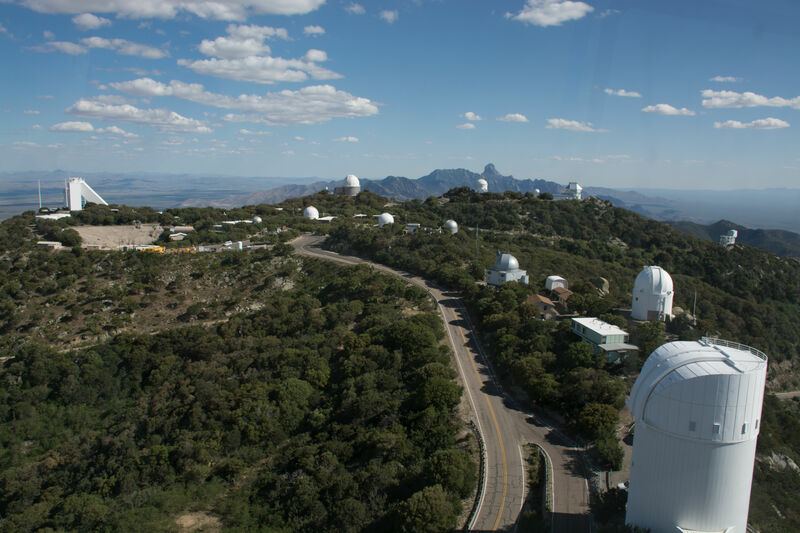 Kitt Peak National Observatory from the gallery of the Mayall 4-meter telescope. Baboquivari Peak, the center of Tohono O’odham cosmology and home to their creator, I’itoi, rises in the distance. 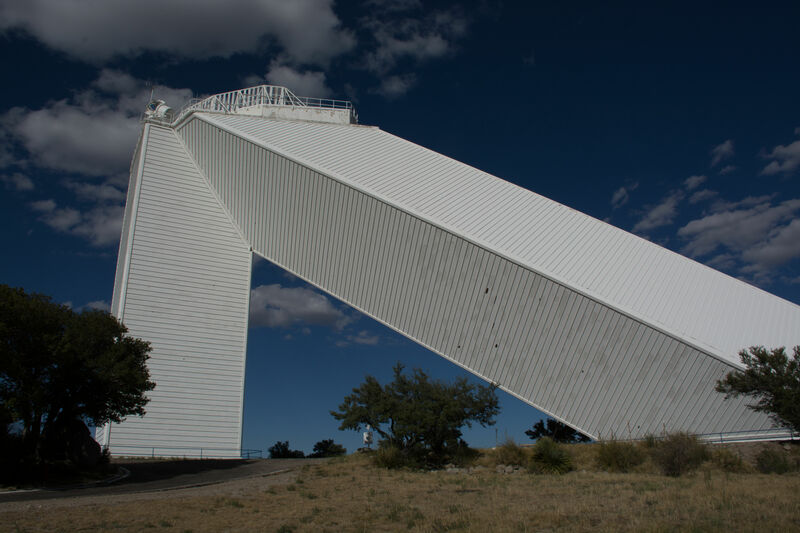 Located on the second most sacred peak to the Tohono O’odham people, Kitt Peak features over two dozen optical and radio telescopes. 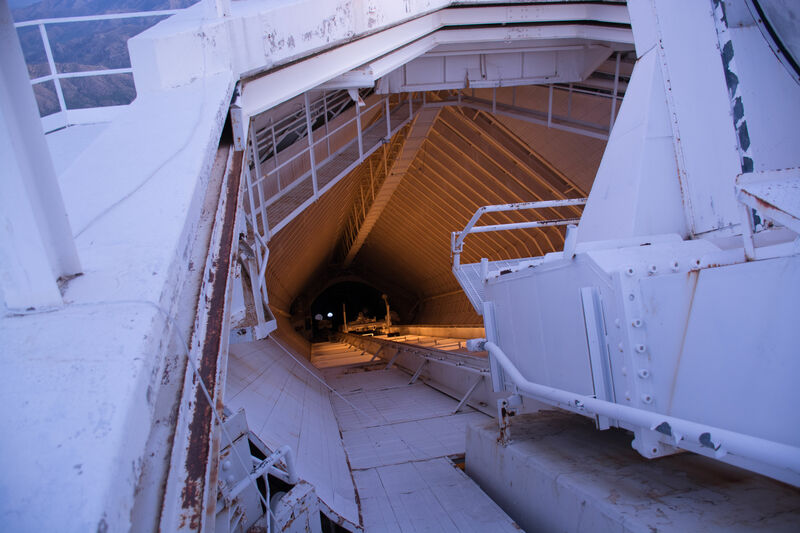 The largest instrument is the Mayall 4-meter telescope, and most iconic is the 1.6-meter McMath-Pierce solar telescope. 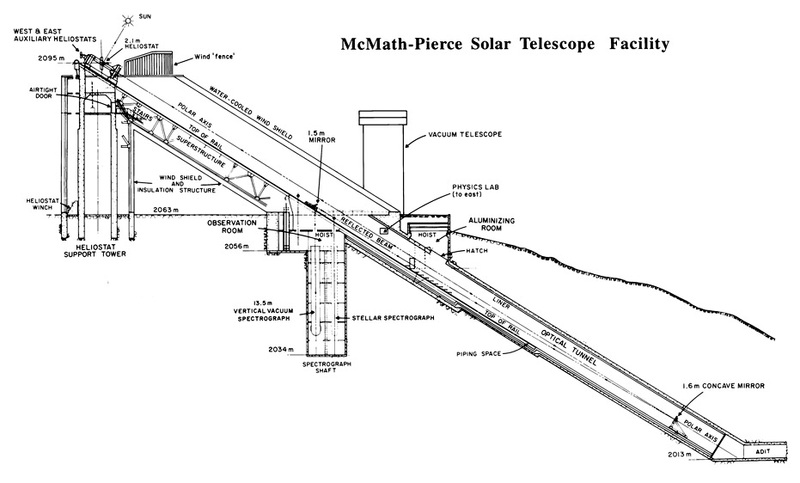 Walking towards the McMath-Pierce solar telescope. 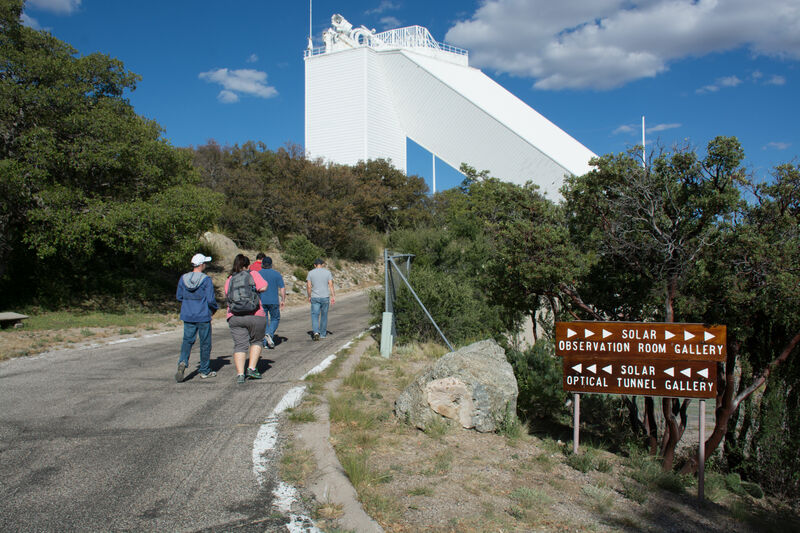 Earlier this month, as a part of the Project ASTRO National Network annual Site Leaders Meeting, a group of us visited Kitt Peak. 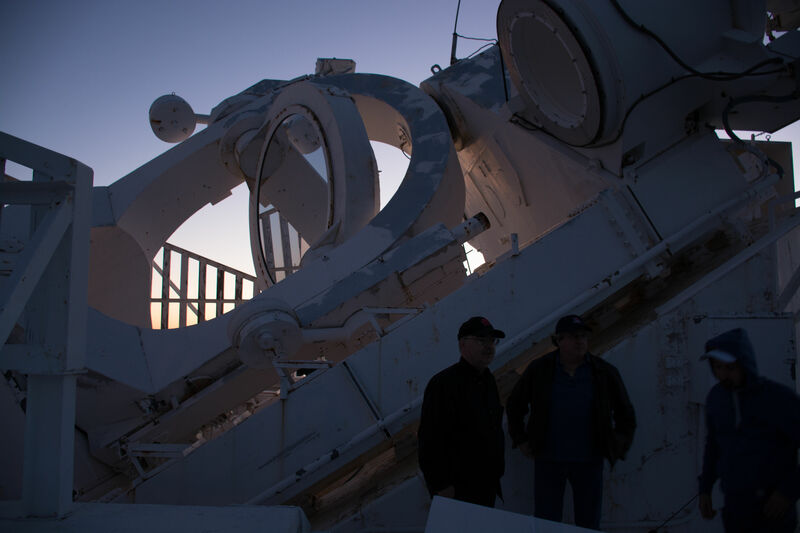 The highlight of the tour was a visit to the solar telescope, and the opportunity to watch sunset on a projected image of the Sun, watching as clouds obscured the solar disc, and as it dropped behind a distant range of mountains. It was an amazing spectacle. 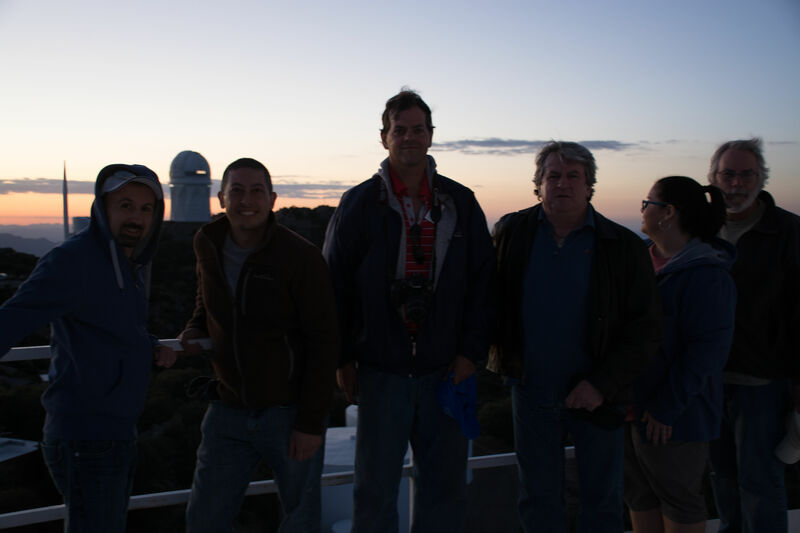 After sunset, the researcher operating the telescope asked us if we wanted to go up to the top. Of course we said yes! And were treated to a view from a hundred feet above the ground. 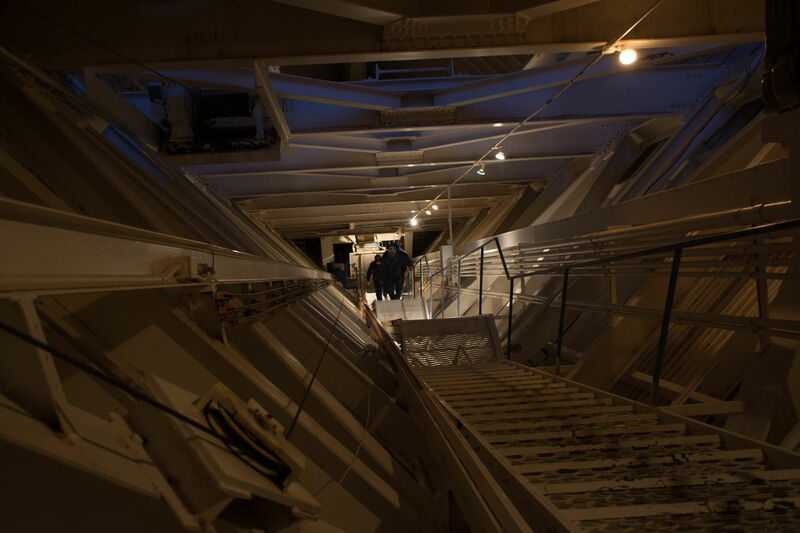 Climbing the stairs inside the superstructure. Looking down the optical tunnel from the top. The heliostat at the top of the telescope. The tall dome to the right houses the Mayall 4-meter telescope. In many ways our society takes the Sun for granted. Astronomers, and particularly those who study the Sun, know better. They are granted a front row seat to a spectacle inspiring awe in anyone fortunate enough to gaze on the phenomena with open eyes and mind.